These results are not official yet and they are not certified. 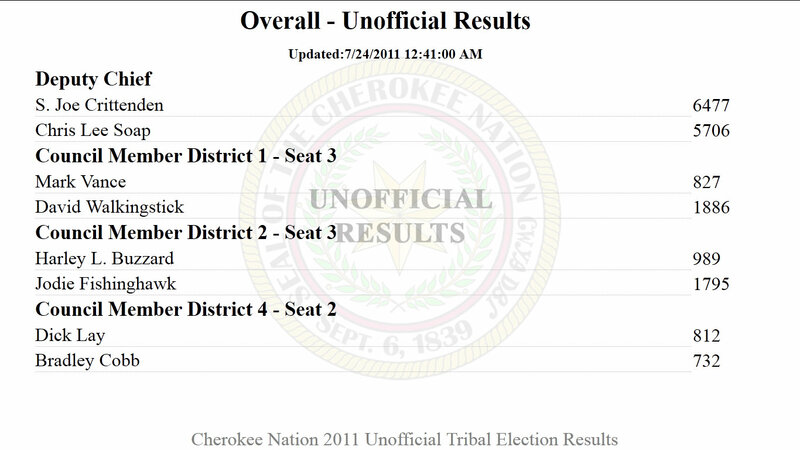 But according to the Tahlequah Daily Press, Chris Soap has conceded the race for Deputy Chief to Joe Crittenden. They will have statements from both in their print edition tomorrow (Sunday.) 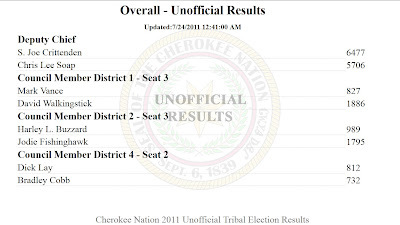 According to the United Keetoowah Band Facebook page, the election commission is still counting/checking 80 challenge ballots. Per a report on the UKB facebook page (they have been covering this tonight), the election commission just left without certifying the vote. Members of the crowd outside were upset and asked why but received no plausible answer as the commission left under guard. Patsy Eads Morton, election commissioner, said the commission is certifying the vote at 9 in the morning. Story in the Cherokee Phoenix HERE.